In the case of installation, it becomes rather a nuisance to have to stop at every step in order to detail progress after the fact. So much of the time, my photographs only tell part of the story. When I have the privilege of participating in off-road events, event capturing will oftentimes translate to standing in the bushes, hanging from tree limbs, or sinking knee-deep in the mud if necessary, in order to do the shots justice. It also means hanging back from the group while everyone else gets to play. For those of you who are willing to go this extra mile, I extend my whole-hearted thanks. Without folks like you, I’d be left with only memories of events past. On that note, here are a few videos that were shot during the annual Coal Mine Cruiser Classic run. If memory serves me correctly, this first video is from 2009 but I cannot provide the location other than to say it was at Rausch Creek Off-Road Park, in Tremont, Pennsylvania. This particular hill wasn’t terribly steep, but the terrain was loose, consisting primarily of sandy, loamy soil. Combined with random rocks and tree roots and it became a bit of challenge in the traction department. But thanks to a good spotter, and the grippy Nitto Terra Grapplers, I was able to traverse the hill with very little problems. 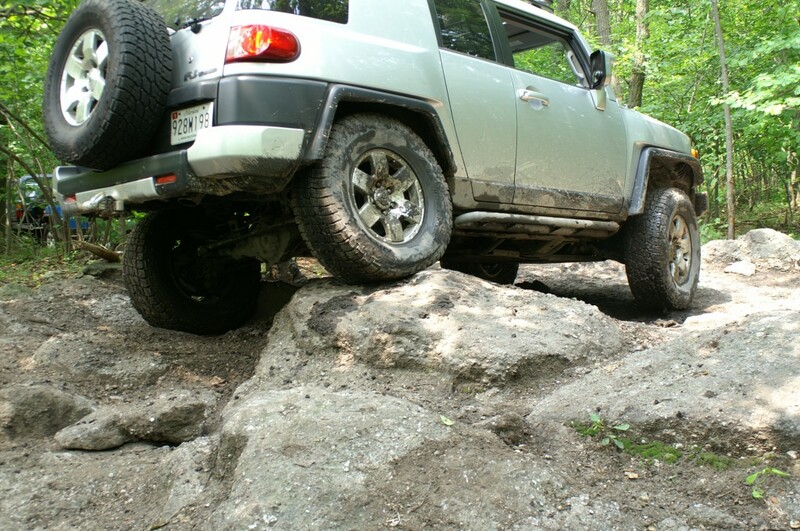 The next video was taken a year later, during the 2010 Coal Mine Cruiser Classic at Rausch Creek ORP. It’s a short clip, but one that exhibits the differences of technique on the trail. More specifically, it provides visual proof that picking the proper line is not just about “winging it” and hoping for the best. In the Jeep’s defense, the driver was not familiar with this trail and the Jeep is a standard transmission, which tends to complicate things when trying to inch your way through or over an obstacle. In my case, it was not only fun with friends, but an excuse to test out the recently installed Interco TrXus Mud Terrain tires. It had rained for several days so the trails were muddy and slippery, but the TrXus tires performed flawlessly regardless of the less-than-optimal trail conditions. A lot changed between the first video and the second video in terms of modifications to the FJ. I’ve also noticed that by making these type of events a regular habit, my off-roading skills have seen a boost in performance as well. I don’t mean to imply that I’m some sort of expert off-roader – not by a long shot. But the experience I’ve gained from these types of events has given me a lot more confidence in the off-roading arena. Obstacles that used to make me hesitate no longer bother me at all. The further I push myself, the more confident I become and the better I get to know my vehicle’s capabilities and limitations. The more testing I do, the more I’m aware of when I can push the limits and when I should back off. It’s an interesting study of man and machine working cohesively towards an end goal.